“It’s a nickname my colleagues gave me,” said Illinois State Biology Professor Andres Vidal-Gadea, who studies how animals detect the Earth’s magnetic field. Now his colleagues can call him something else: the world leader in understanding the key to how animals migrate. receptor in the brain that helps animals use the planet’s magnetic field to navigate. A research team that Vidal-Gadea led while a postdoctoral student at the University of Texas at Austin discovered the sensor in tiny worms called C. elegans. The research, published last summer in the scientific journal eLife, places Vidal-Gadea on the frontier of neuroethology—or the study of how animal behavior is linked to the nervous system. 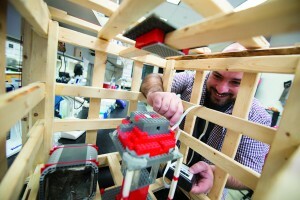 Andres Vidal-Gadea at work in a laboratory at Illinois State. What researches have not understood—until now—is how the brain receives and interprets the magnetic field. “We have known that many animals have a set of magnetic beads that act like the needle of a compass, but what we did not know is how the brain senses it. We did not know what the magnetic receptor looked like,” Vidal-Gadea said. These worms possess only 302 neurons, making them ideal for research. The team found the sensor in a neuron that had been well studied. “This same neuron detects carbon dioxide and soil temperature for the worms, so it makes sense that it is also the magnetic receptor in what amounts to a depth receptor,” said Vidal-Gadea. When the temperature of the soil rises, the worms tend to migrate down to cooler soil, toward the roots of plants, where the C. elegans’ main food source, bacteria, tends to grow. In Vidal-Gadea’s lab, students have continued to run tests to understand the sensors on a molecular level, with the hopes of helping researchers across the globe understand magnetic detection. Using fluorescent dyes, his team tags the very proteins that convert the forces of the magnetic field into information the neurons use. Inside the box sat a case where lab students placed a small petri dish holding around 100 C. elegans. The case looks oddly familiar—gray and red blocks stacked on top of each other. “It’s made of Legos,” Vidal-Gadea said with a smile. “We needed something not made of metal.” Standing firmly on guard in front of the case is a tiny Lego figure of the X-Men character Magneto, in a nod to Vidal-Gadea’s nickname. Vidal-Gadea explained how the surrounding wires allow those in the lab to manipulate the magnetism within the box. “We can simulate almost no magnetic field at all, and see how that affects the worms.” The C. elegans worms only take three days to go from egg to adulthood, so the experiment can bring quick results. Vidal-Gadea has been studying magnetic detection since his undergraduate days at the University of Victoria in British Columbia, Canada. 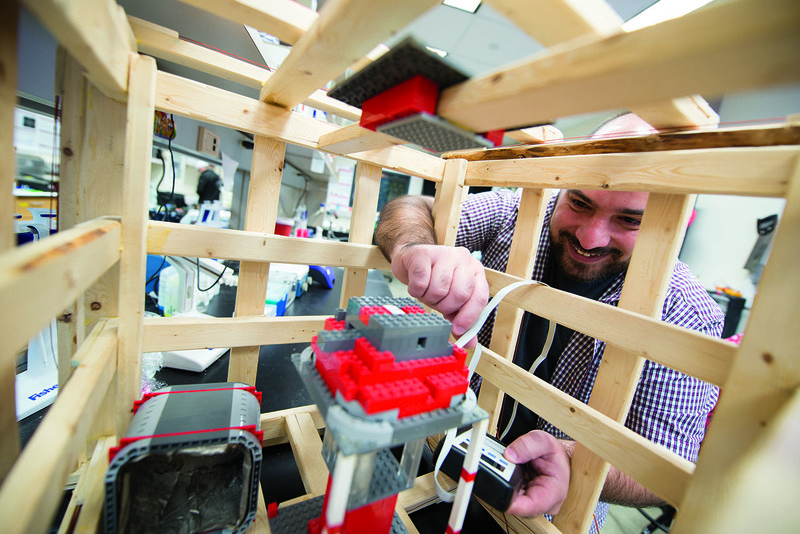 Though his work and acclaim have taken him to the University of Texas, Louisiana State University, and Southampton University in England, it was at Illinois State that Vidal-Gadea decided to continue his groundbreaking research.